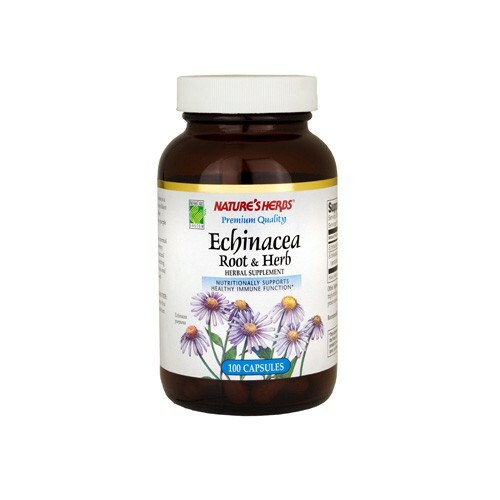 Nature's Herbs premium quality Echinacea is a skillful blend of the finest Echinacea Purpurea Root and Herb and is harvested from around the world. Echinacea Purpurea is also known as purple coneflower. Our exclusive FreshCare system inhibits normal plant oxidation, maintaining product potency and extending freshness. It includes all-natural antioxidants in each capsule, oxygen-absorbing packets in each bottle, special air-tight seals and amber glass packaging for uncompromised quality. Unconditional Product Guarantee: Nature's Herbs unconditionally guarantees this completely natural product to your satisfaction. Disclaimer These statements have not been evaluated by the FDA. These products are not intended to diagnose, treat, cure, or prevent any disease.